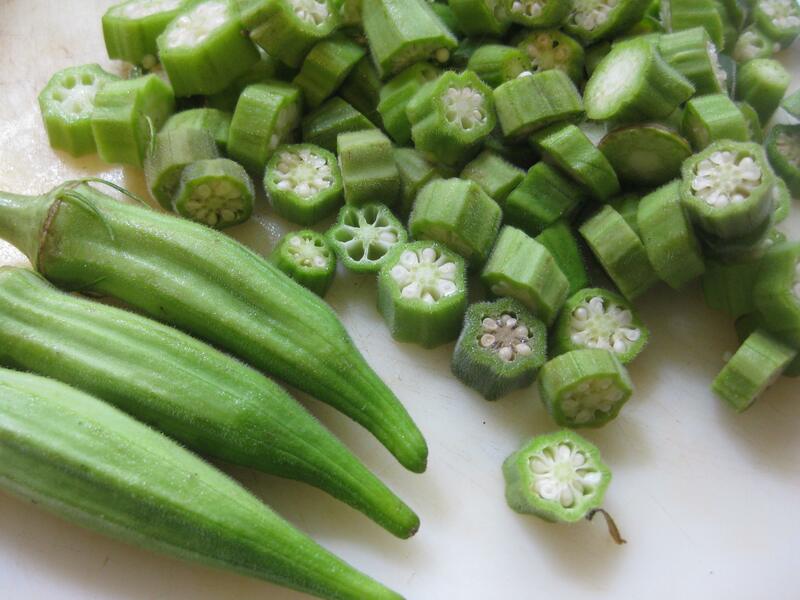 Okra at our CSA is in overdrive. We are harvesting one, two, and now even four quarts per week. While I’ve already pickled some, the rest has been cooked six ways to Sunday, as I posted last year: steamed, stewed, frittered and fried, not to mention gumbo. 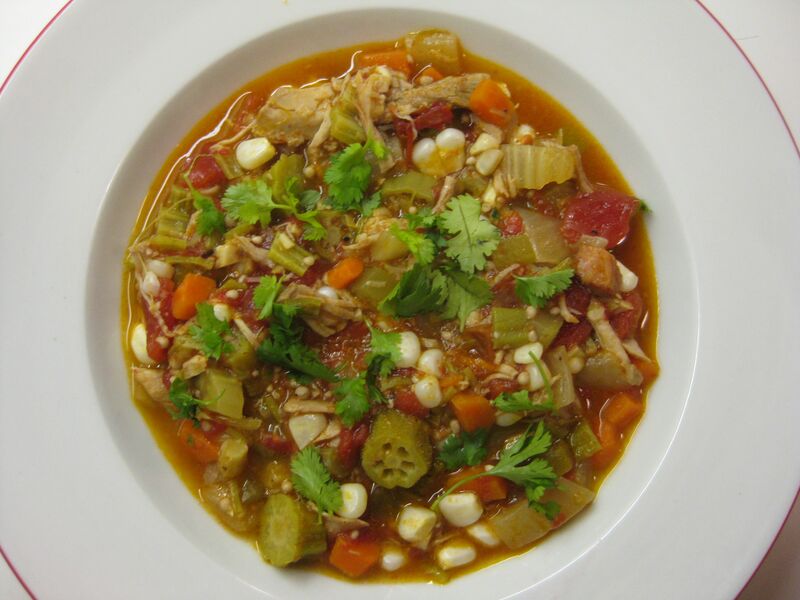 Mark Bittmann of the New York Times recently wrote about an okra stew, which really was a pork stew in disguise. He claimed his okra “went away” in the process. While the recipe ingredients were generally to my liking, I played around a bit with the dish, using both okra and tomatoes in their fresh state. The fact that Bittman thought that frozen okra was fine and used canned tomatoes probably accounted for our different textural results. While I am not a big fan of frozen vegetables (despite having grown up freezing bushels of produce from our garden), I do freeze soups, stews, chili, lasagna and other prepared foods, which can be defrosted easily for busy midweek meals. This one is a winner. I’ve made it twice this week, first to try it and second to accommodate our New York evacuees fleeing the hurricane. And I hope to have some left over to freeze for a last-minute midweek supper this fall. Heat the olive oil over medium-high heat in a Dutch oven. Add the pork and the chili pepper and brown the pork on all sides, removing it to a bowl. Add the bacon and ham to the pot and cook over medium heat until the bacon has rendered its fat and is starting to brown. Add the onion, celery, carrots and green pepper and stir to combine. Cook until the vegetables are tender and the bacon is brown. Add the garlic and cook until the garlic becomes aromatic. Add the white wine and cook for a minute or two. Add the okra and tomatoes and stir to combine. Add salt and pepper. Return the pork to the mixture and place in a 250-degree oven to cook for two hours, stirring occasionally. The dish can be cooked to this point and cooled, kept refrigerated for a couple of days. 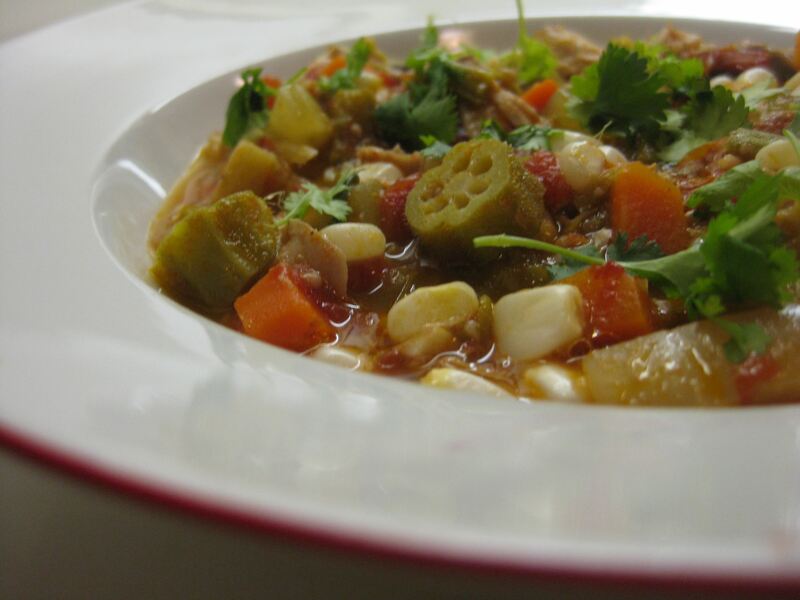 When ready to serve, heat the stew and add the corn kernels if using. Cook until the corn is tender, about 5 minutes. Taste for seasoning and add salt and pepper and a splash of vinegar if desired. Serve over rice or as is.